The streaming service will add improvements every two weeks. YouTube Music launched in May to mixed reviews. Even though its song catalog matches Apple Music and Spotify's (in addition to millions of videos pulled from YouTube) it arrived missing some essential features. Something as simple as sorting out your saved albums alphabetically, for example, isn't an option. You also can't browse by genre or easily see new albums from the week. But Google, which will replace Play Music with YouTube Music, is aware of these shortcomings and plans to address them soon. The company told Engadget that it plans to rollout improvements on a regular schedule every two weeks. This includes much needed changes to the user interface, like being able to sort your albums by something other than recently added -- which we're told is "firmly on the roadmap." 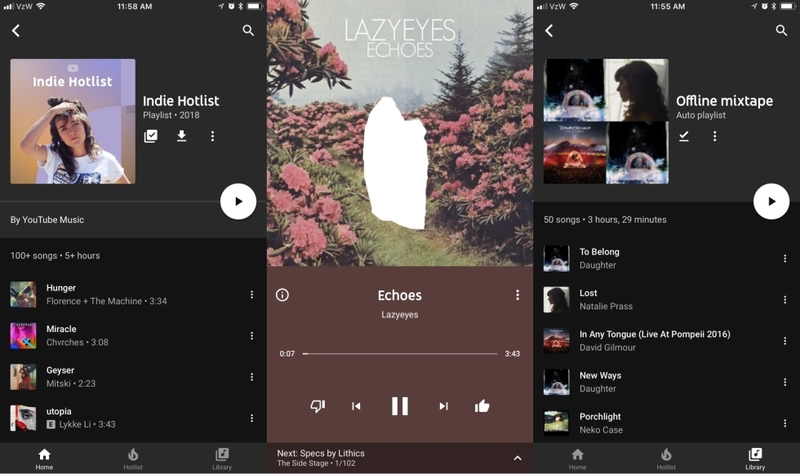 Elias Roman, a product manager for YouTube Music, said that's one of the reasons his team removed the "shared history" feature, which was creating a messy experience by mixing what a user listened to on YouTube Music and the YouTube video site. Similarly, following an artist on YouTube Music automatically subscribes you to them on YouTube. And there's no way to filter them out from, say, the YouTube creators you want to watch on the video site who aren't singers. Roman said that, in the future, this could be fixed by adding a drop-down menu that'll filter out musicians you've followed on YouTube Music. With more than 1 billion people going to YouTube to listen to music, Google believes there's value in combining that experience with its new streaming service -- that's why it wants to make YouTube a core part of YouTube Music and vice versa. Roman said that one of the main requests since launch came from Android users who wanted to store music on a hard drive or SD card, which he said is a feature that's now rolling out to subscribers. Additionally, Roman told Engadget that, in the next few weeks, YouTube Music will be introducing a way for users to select audio quality for streaming and downloading. That means you'll have the ability to specify whether you want to stream or download your songs in low, medium or high quality settings. You could argue that those missing features should've been available from day one, but at least Google isn't completely ignoring them. "We basically got to a point where we felt like what we had was good, ready to see the light of day," said Roman about the launch of YouTube Music. "But there is still a ton of work to do... it's a constant iteration." Ultimately, listening to user feedback and making changes quickly is going to be extremely important for YouTube Music as it grows. Especially if it wants to be considered a serious competitor to the likes of Apple Music or Spotify. And if you're wondering about exclusives, don't hold your breath waiting for them: "We are not focused on exclusives. We don't believe exclusives are good for the industry or good for consumers."